Benedict Cumberbatch’s Sherlock has been named the world’s favourite BBC TV character after coming top of a new poll by BBC Worldwide. 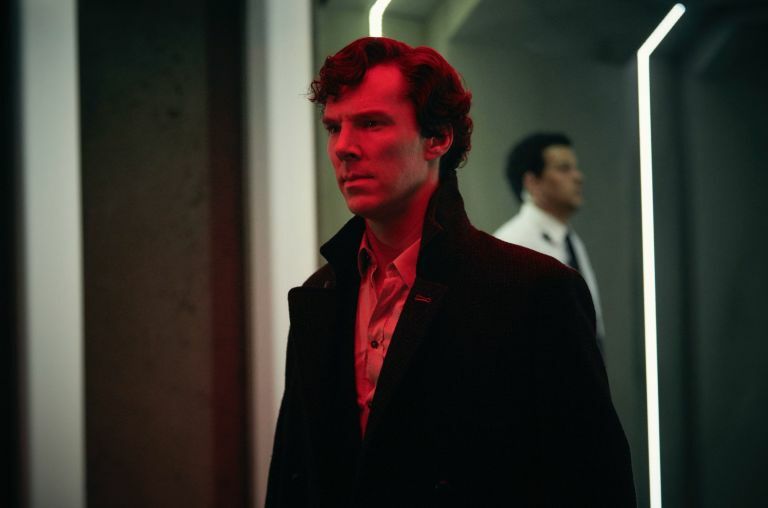 Cumberbatch has portrayed Arthur Conan Doyle’s famous detective since 2010 in a modernised version of the series created by Steven Moffat and Mark Gatiss. The series has been a critical and commercial success, winning BAFTAs and Emmys across the board and attracting audiences across the globe. Cumberbatch beat out other iconic BBC characters including Basil Fawlty, of Fawlty Towers fame, and Doctor Who‘s The Doctor. Speaking about his incredible win, Cumberbatch expressed his delight at a “high-functioning sociopath” winning the prestigious title. He said: “I’m honoured to hear that my portrayal of Sherlock has been internationally recognised as viewers’ favourite BBC TV character. Sherlock Holmes also won the award for most memorable BBC scene, for Sherlock’s elaborate death scene at the end of season two episode ‘The Reichenback Fall’. It was later, unsurprisingly, revealed that the moment when Sherlock fell several storeys to his death was faked. 26% of the total vote went to the climactic death scene beat out the famous Dead Parrot sketch from Monty Python and Colin Firth’s Mr Darcy emerging shirtless from the lake in Pride and Prejudice. Sherlock showrunner Steven Moffat has discussed potential storylines for series five, should the show continue for more series. The popular crime series is based on the stories written by Arthur Conan Doyle and has so far adapted stories such as A Study in Scarlet and The Hounds of Baskerville for a modern audience. Doyle wrote a total of sixty adventures featuring Sherlock Holmes, meaning there is ample material for a fifth series. 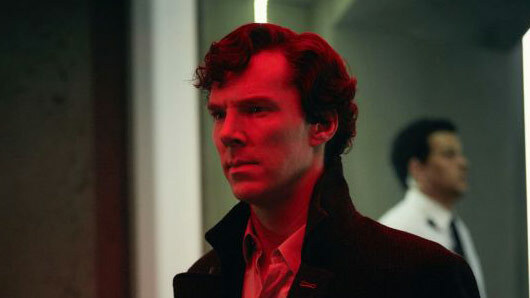 Speaking to Vulture, Moffat discussed the difficulties of adapting Conan Doyle’s works for feature-length television. “We’ve done The Hounds of Baskerville. We’ve sort of done The Sign of the Four in different ways [as The Sign of Three]. The rest of them you can’t really adapt into movies. Moffat also discussed the specific Holmes stories that he and co-creator Mark Gatiss, who also plays Mycroft on the show, in the future. “Mark’s always wanted to do The Red-Headed League [and] there’s The Engineer’s Thumb, which is a slightly mad story that doesn’t have a proper ending. “There’s an element of The Greek Interpreter that I think is really exciting, which hasn’t been done, because in our version of events Irene Adler is still out there. There’s always that. We know you’re probably still trying to recover after the explosive series finale last night, but Sherlock fans may now also be forced to accept that this was the end of the show for good. 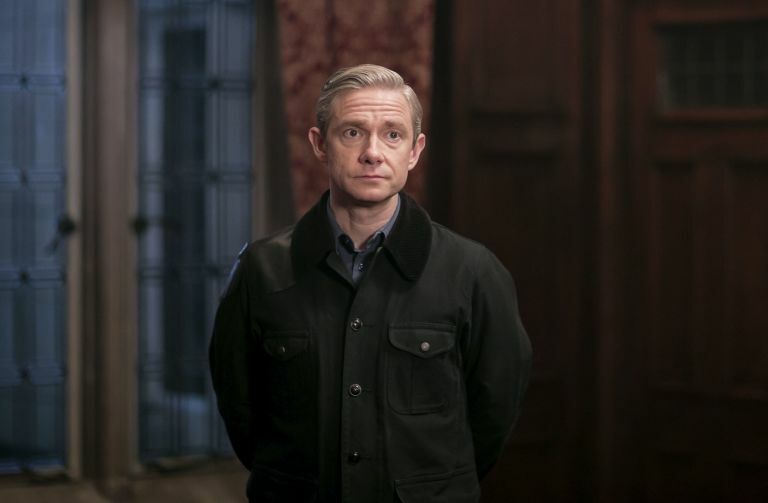 The 2017 series of Sherlock was wrapped up in an intense finale last night and, although the episode concluded with possibility for future adventures, the usual cliff hanging element was noticeably absent. Series writers Steven Moffat and Mark Gatiss have revealed that this was an intentional decision. When asked if this was indeed the final series, Moffat admitted: “We’re not planning it to be [the final series] but it might be, it’s possible, and we could end it there. The final shot of the finale saw Sherlock, played by Benedict Cumberbatch, and Dr. John Watson, portrayed by Martin Freeman, at Rathbone Place. This reference was in tribute to actor Basil Rathbone, who played Sherlock Holmes in the 14 films between 1939 and 1946. Gatiss explained: “It’s actually weirdly a backstory. Whatever is in store for the series, Moffat and Gatiss have insisted that they will not be handing Sherlock over to new showrunners. The first teaser pictures from the explosive Sherlock series four finale have been released. Sunday night’s The Dying Detective shocked us all with the last-minute reveal of Sherlock’s secret sister Euros, a character who had been hiding in plain sight throughout the series. After revealing herself to be simultaneously John’s therapist, friend from the bus and the subject of what Sherlock believed a hallucination, Euros aimed a gun at John and pulled the trigger. Judging by the fact John appears to be alive (but it all could be a hallucination like Mary, couldn’t it?) in the teaser images for episode 3 ‘The Final Problem’, we’re hoping this dramatic ending wasn’t John’s dramatic ending. 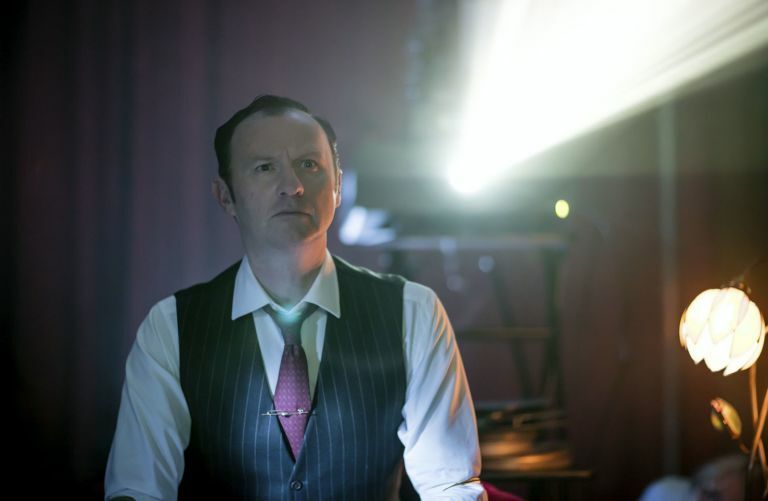 In the other pictures, Mycroft appears to be staring at some perplexing in the distance. Could this be Euros-related? 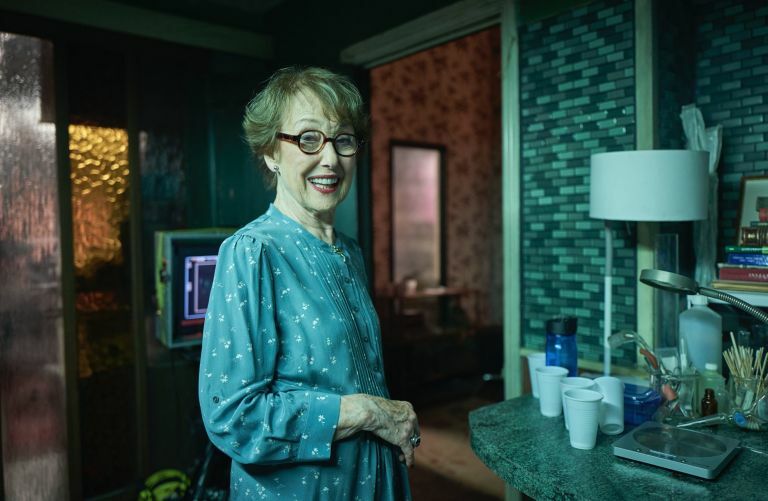 Elsewhere, Mrs Hudson is extremely happy about something. We’re not sure what this could be or how it fits with the general dark tone of the series so far, but we’ll be happy for any type of relief at this point! Sherlock concludes Sunday at 9pm on BBC One. 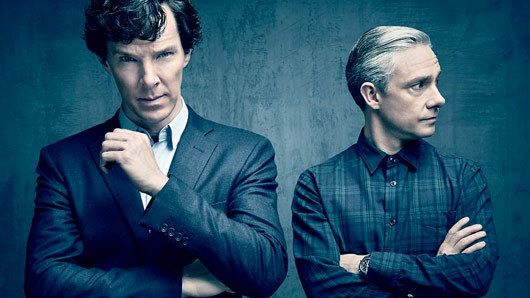 Could Sherlock be coming to an end after series 4? 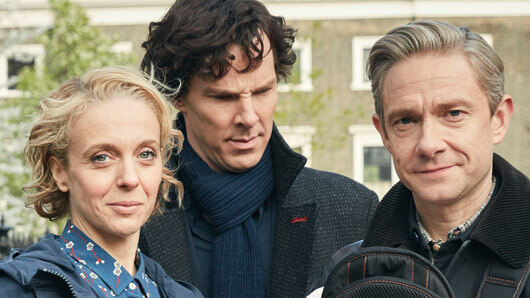 Sherlock may wrap up for good at the end of its current run. 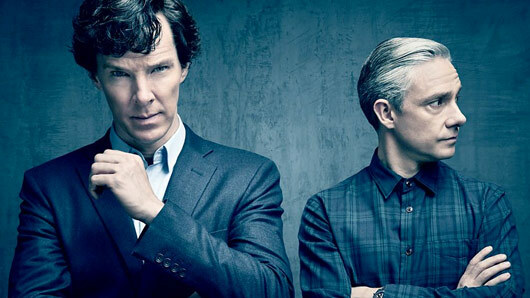 Fans have waited two years for the fourth season of the popular crime drama, which stars Benedict Cumberbatch and Martin Freeman. However, creator Steven Moffat has now admitted he is considering ending the series on a high rather than continuing and risking a dip in quality. Speaking at a BAFTA screening of episode two of the new series ‘The Dying Detective’ on Sunday morning, Moffat described the third and final episode of this series as a “grande old finale”. His phrasing immediately attracted questions from the audience as to whether this finale might not only be for series four, but the show as a whole. He clarified that he did not mean there will absolutely be no more Sherlock, but confessed to being unsure of the show’s future. If the series does come to an end after next week, it will not be for lack of viewers. 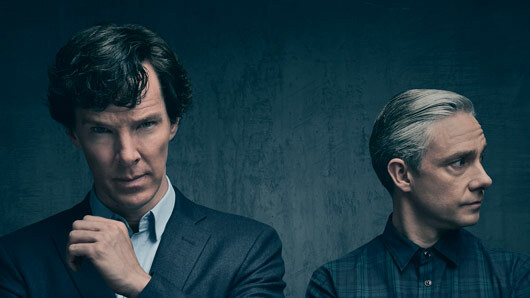 It was announced last week that the New Year’s Day episode of Sherlock drew in the most viewers of any TV drama over the entire festive period, beating out shows such as Call The Midwife and the Christmas soap heavyweights. 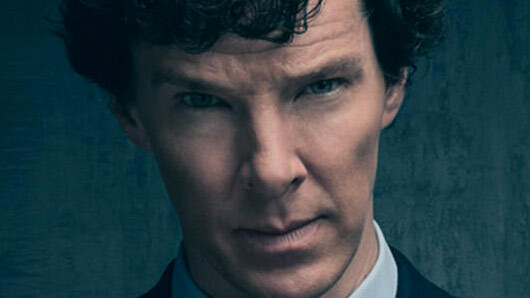 Sherlock continues Sunday at 9pm on BBC One. The BBC dropped a brand new trailer for Sherlock last night after Strictly, and boy is it intense. The new series is scheduled to begin on New Year’s Day at 8.30pm with ‘The Six Thatchers’. The following episodes will follow weekly, with the second titled ‘The Dying Detective’. On-screen, we get some ominous shots of an anxious-looking Sherlock and Watson, plus one shot of someone’s house burning down as a suited man watches. We also get a glimpse of new villain Culverton Smith, played by Toby Jones, as he appears to taunt Sherlock. Series boss Steven Moffat previously told Collider that Smith was “the purest evil” and “the darkest villain we’ve had”. The trailer ends on a moment that fangirls will replay over and over again, as Sherlock says to the camera: “I love you.” It’s clear this isn’t the desired love scene between Sherlock and John however, but that something more sinister is at work. What time will Sherlock return on New Year’s Day? The broadcast time of the new Sherlock series on New Year’s Day has been revealed. Fans have been looking forward to this moment basically since season three ended nearly two years ago. Fortunately, the wait is nearly over. According to digiguide.tv, the eagerly awaited fourth season will begin at 8.30pm on New Year’s Day. We might even be over our NYE hangovers by then. We last saw Benedict Cumberbatch’s Sherlock Holmes and Martin Freeman’s John Watson on New Year’s Day 2016 during the Christmas Special ‘The Abominable Bride’. While the episode was largely set in Sherlock’s ‘mind palace’ – which looked a lot like Victorian England – we did learn something vital at the end. Sherlock believes that others are carrying out Moriarty’s plans after his death is season two. Presumably, season four will pick up from this point – but everyone involved has been tight-lipped so far. One thing we do know is that this season will be three more episodes and the first two are titled “The Six Thatchers” and “The Dying Detective”. Meanwhile, Benedict Cumberbatch has teased fans by saying they will need a breather following the conclusion of series four. He also refused to rule out a fifth series of the much-loved adaptation, although admitted fans might have to wait quite a while for it. Sherlock will return to BBC One at 8.30pm on New Year’s Day. 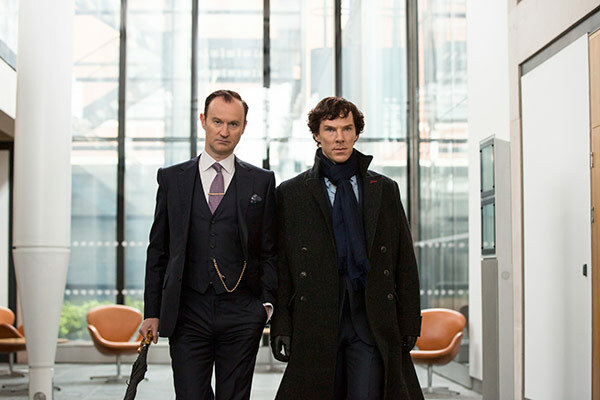 The first pictures from the upcoming fourth series of Sherlock are here. 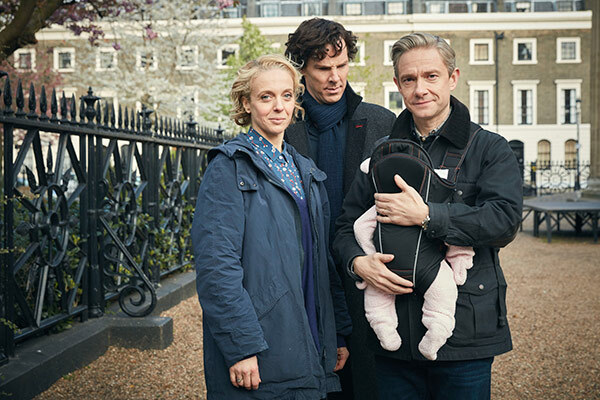 Fans of all things adorable will enjoy the new images, which include John Watson with a newborn and the Watson family’s pet dog. 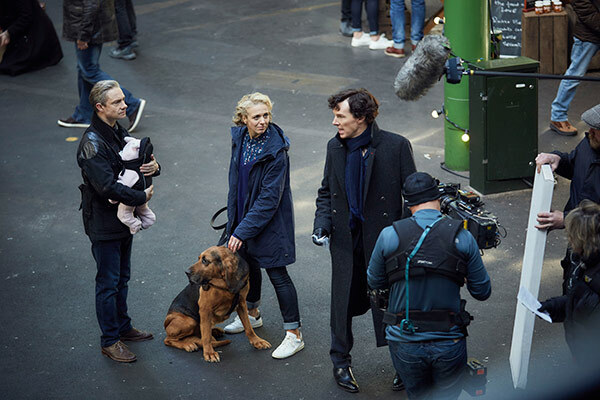 Sherlock, however, looks less than impressed by the newest addition to the Watson family. In one picture, he’s observing the baby with a very grumpy expression. Could sleepless nights and dirty nappies be getting in the way of Sherlock and Watson’s adventures? 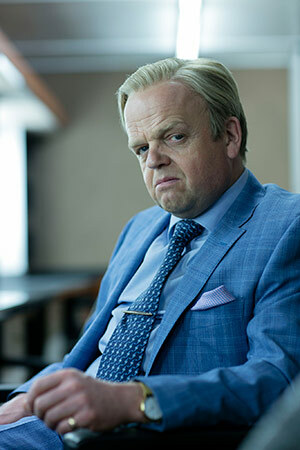 The images also give us our first glance at series four’s new villain Culverton Smith, played by Toby Jones. Last August, Sherlock showrunner Steven Moffat said Smith was “the darkest villain we’ve had”. 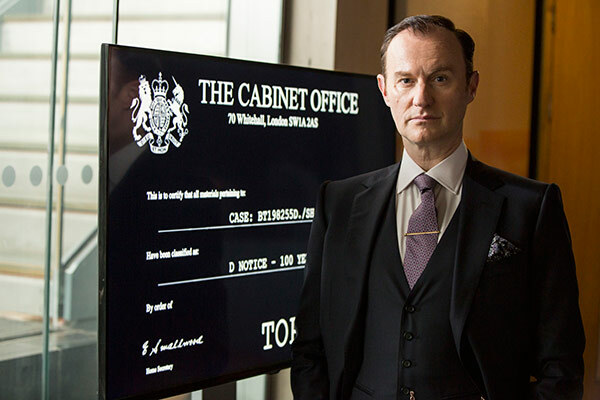 Speaking of Gatiss, there’s also an image of him in character as Mycroft Holmes at the Cabinet Office in London, as well as a family pic with him and brother Sherlock. Sherlock returns to BBC One on January 1, 2017.